DJ wordpress theme’s original name is actually “Masterplan” designed by unodesignstudio.com. 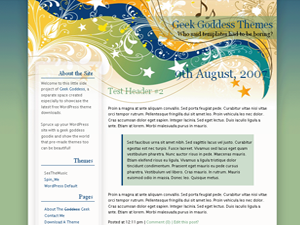 This is a two column wordpress template with white main content area and gray sidebar. Titles are black and so is the blog master background. 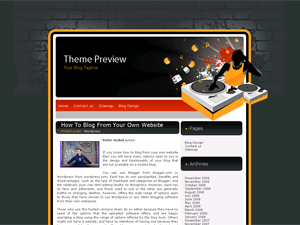 This blog is perfect for a DJ or music composer because it features a dj spinning his turntables in the header graphic. DJ wordpress skin supports Widgets (you just have to enable them in your blog’s admin area – see under Appearance tab). 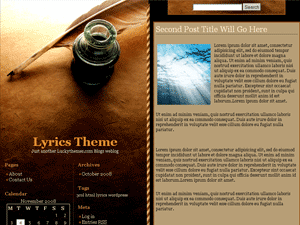 Lyrics wordpress theme is a perfect design for a song writer, poetry writer, or any type of writer actually. This is a dark to light brown wp skin with 3 columns. 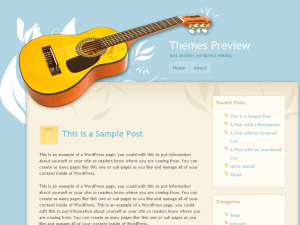 Two sidebars are located on the left side – the outermost sidebar supports wordpress widgets. The inner sidebar contains archives and Meta. The header graphic is not actually on top, it’s on the left side just above the sidebars and features a real writing pen and a bottle of ink. 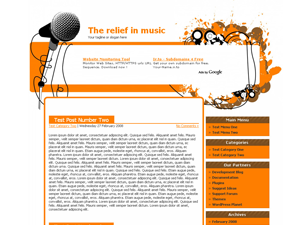 Main content area is on the right side and is a bit lighter than the rest of the wp design. Search function is just above the main content area.